Polling in New York has generally acquiesced to about a 12% margin in favor of Hillary Clinton. Our projections, based entirely on topline polling, place the race at 51.8-40.25%. Each candidate continues to draw support from their normal demographics, Hillary from Females and Blacks, and Bernie from Males and Whites. Bernie is just marginally winning Males by .51% and losing Whites by 8%. These demographic numbers roughly align with Bernie's worst performance in a northern state, Ohio. The expected outcomes of Males/Females and Blacks/Whites is generally understood, but that only covers about 90% of the expected electorate in New York. In 2008 , based on exit polling, Latino/Hispanics accounted for 10% of the turnout. The polling in New York for Hispanics has been all over the place and there is very little evidence from other states to establish any consistent expectation. There are just four states in which Hispanic outcomes were assessed via exit polling, Nevada , Florida , Texas  and Illinois ; Bernie won the former by 6%, lost in the other two southern states by 40-ish% and Illinois was 50-49. We're making explicit reference to northern and southern states because they are exhibiting distinct trends. We have demographic data entered for all polls in New York based on gender and race, so you can browse through the data and draw your own conclusions. 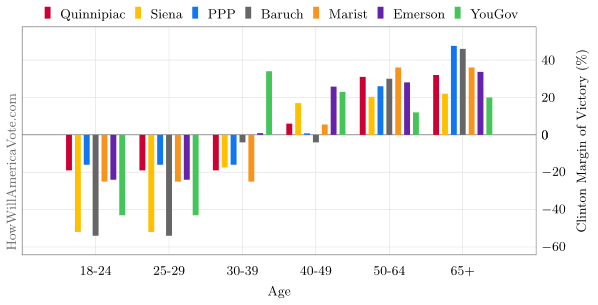 We are not currently collecting data by age because of the incomparability of the different age groups used by pollsters; we discussed this problem in more detailing while analyzing age outcomes in Michigan. 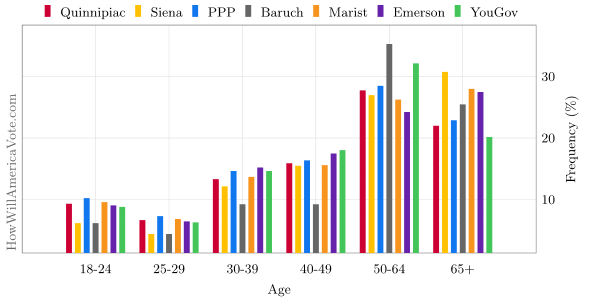 We've selected the 7 (of 8) most recent polls in New York which have released sub-sample data by age. We excluded the Fox News poll because they did not provide the number of subjects in each group. As you can probably tell from the above image, older people are expected to vote in larger numbers. The averages for each of the 3 younger groups deviate from the 2008 result by less than 1%. The older 3 groups are fairly close to the 2008 outcomes as well, but the oldest group is over-sampled by about 5% with the 40-49 and 50-64 groups were deprived. There is certainly some rounding and extrapolation error present, but the overall takeaway is that the polling samples, by age, are reflective of the 2008 primary electorate. The 18-24 and 25-29 age groups are identical; this is a ramification of no pollster releasing details beyond the under 30 group. The process linearly extrapolates because there isn't any information to make a more reasoned estimate. Another oddity is the large green spike in the 30-39 group from YouGov; I've doubled checked the data is correct so it may just be a sampling anomaly. Not surprisingly Bernie does much better among younger voters based on the data; but its not better enough to win. Of the last 4 primaries held in northern states with exit polls, IL , MO , OH  and WI , Bernie has won the 18-29 age group by an average margin of 61.25%, with the lowest coming in Missouri at 57%. Not a single poll from New York has the margin that high, and most have it much lower. There is again error introduced from rounding and the age normalization. Overall pollsters are expecting smaller margins in the youngest age group relative to other states. New York's primary does differ from previous states in that it is a closed primary, meaning only already registered Democrats can participate. There is one question in exit polling to suggest that those who think of themselves as Democrats are historically more inclined to support Hillary Clinton, but the results are not provided by age. The question that needs to be asked is whether younger, registered Democrats in New York, are going to support Bernie in similar margins as other states. If the answer is yes, the race is closer than polling indicates.